Make a slit down the center of each bangus belly to form a pocket. Season with salt and pepper. 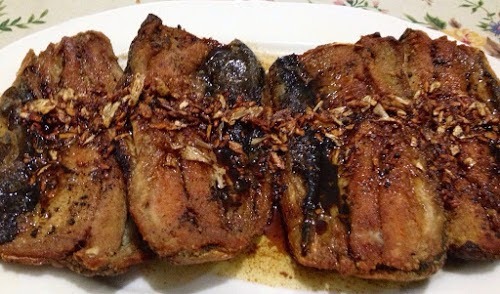 Divide basil mixture equally into six and fill each slit of bangus with basil mixture. In another bowl, combine breadcrumbs, butter and parmesan cheese. Mix thoroughly. Top each belly with the breadcrumbs mixture. Press lightly so mixture adheres. Chill in refrigerator about 1 hour. Meanwhile, brush a baking sheet with olive oil. Set aside. Arrange bangus belly skin side down on prepared baking sheet. Bake for about 12 to 15 minutes or until center becomes opaque. Transfer to plates and serve.